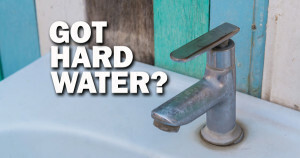 Hard water is an extremely common problem in the United States that occurs as results of high levels of dissolved ions such as calcium, magnesium, and iron, says Local Records Office. These molecules are found naturally in the earth’s soil and have varying concentrations depending on the composition of the soil in different parts of the country. As water falls from the sky and travels through the ground, it collects many different particles that it then carries to water collection facilities that are responsible for ensuring the safety of the water before it is pumped to residential neighborhoods. Because hardness causing ions do not pose significant health risks to humans, most treatment facilities are not required to remove them. Homeowners who live in areas of the US that experience varying degrees of hard water often have some common problems in their home including decreased lather and effectiveness of soaps and detergents, scale deposits on bathroom fixtures and the bottom of pots, damaged appliances, clogged pipes, and an accumulation of soap byproducts on the skin that can cause dryness and itchiness. The level of irritation that results from these issues is usually related to the severity of hardness in the water. Individuals who experience minor amounts of harness may not be inclined to pursue a solution while those who have a severe hard water problem often seek the advice of water softening specialists. What’s Products are Available for Softening Hard Water? There are numerous softening products currently being sold in the US that usually claim to soften water using a variety of techniques. The two broadest classifications for softeners include salt-based systems and salt-free systems. Products that use salt are able to remove the calcium and magnesium ions from the water completely and discharge them in the wastewater system before the softened water enters the main plumbing network in the home. Products that do not use salt are supposed to be better for the environment and may utilize a variety of techniques for altering the structure of hardness causing ions so that they are unable to precipitate out of the water and create troublesome scale deposits. Since salt-based softening systems tend to be far more effective than salt-free alternatives, most of the installers in the US recommend using these products rather than try to alter the structure of the ions. A brand that has been around for several years and that specializes in salt-based systems is known as Fleck and is commonly used by both professionals and independent homeowners alike. The three models that are most popular from the Fleck line of products include the basic 5600 model, 5600 SXT model, and the 7000 SXT model, Each product will work to remove the majority of the particles that can cause hardness from the water, but the systems vary in terms of their computer automation and the amount of manual labor required to keep them operating in an effective manner. The basic 5600 Fleck water softener model has a manual control dial that allows the user to set an exact time of day for the regeneration process. This is required to remove the calcium and magnesium ions on the resin bed from the system. Newer models of the 5600 line of products are able to keep time during a power outage and may utilize either a manual or automated regeneration control system. The 7000 SXT Fleck water softener has higher flow rates as well as an additional cycle that can be controlled using the computerized timing system. Details about how to install and program each product are provided in the user manual that accompanies the purchase of the product from a licensed dealer. Are All Brands Salt Based? While there are several other effective salt-based water softener brands available, Fleck has become a well-respected and widely used company because of their reliability and the fact that they have over 50 years of experience in the industry, Although homeowners do sometimes choose to purchase and install a system on their own, it is generally recommended that a professional installer be contacted to do the job since many manufacturer warranties may become void unless installed by a certified professional valuable support over the years in case problems arise.